How To Love The Zombie Apocalypse : 13.7: Cosmos And Culture How did the Zombie Apocalypse become a ubiquitous all-consuming (no pun intended) meme? Adam Frank says we keep re-telling this story because it's trying to tell us something about the future. Are we listening? 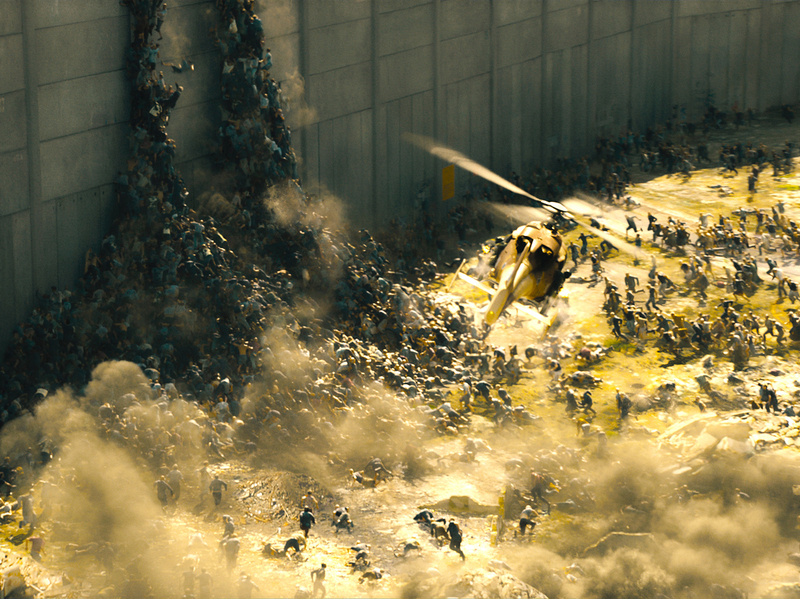 World War Z is just the latest pop-culture incarnation of the Zombie Apocalypse. Adam Frank says the zombies keep coming because they're trying to tell us something. "Zombie Apocalypse? What the hell are you talking about?" It was our weekly astronomy group lunch when everyone, from the professors down to the undergrads, gets together for pizza. I'm not quite sure how the conversation took this turn, but at some point I quipped: "But of course that's after the Zombie Apocalypse." Everyone at the table nodded knowingly. Everyone, of course, except one of our emeritus professors who, as she so strongly noted, had no idea what the hell we were talking about. And that got me thinking. How the hell did the Zombie Apocalypse become a ubiquitous all-consuming (no pun intended) meme? What is it about the story of hungry undead that keeps it from ever dying? After watching World War Z this weekend, however, I finally realized I was asking the wrong question. It's not the why of the Zombie Apocalypse that matters, it's the how. For here, at the dawn of a new age of planetary limits, zombies are our greatest teachers. There are not many fully modern mythologies (something I've written about before). True mythologies are stories that give both instruction and insight. In the long march of human evolution, we've accreted a storehouse of such myths. These are narratives across time and culture that speak to the common experience of being human: the hero's journey; the coming of age; the passage to mortality. These stories became codified over many thousands of years and that is what makes them universal. But the speed of our recent cultural evolution makes it difficult to lock in new stories speaking to the experience of living in complex technological societies. In a previous post I wrote that our many tellings of the Robot Overlords meme was one form of modern myth. The Zombie Apocalypse — with its prevalence in movies, books, TV shows and comics — must be counted as another. But what exactly is this myth trying to teach us? By now there must be thousands of undergraduate (and Ph.D.) thesis papers asking about the meaning of zombies in general: the fear of death, the metaphor of consumer culture; you fill in the blank. But what is more important for us today is the apocalypse part of the Zombie Apocalypse. That's where we will find the itch that really needs to be scratched. World War Z begins with a montage of TV clips: news stories of climate change, environmental degradation and political turmoil are contrasted with reality TV and talk show inanity. And all of it is set against images of the natural world's predatory ruthlessness via images of swarming ants and the like. The planet is falling into chaos while we blindly amuse ourselves: cue the Zombies and the collapse of civilization. Food doesn't show up at the stores. Gas doesn't show up at the gas stations. Electricity doesn't show up at the outlet. Oh yeah, and while all that's happening, your former neighbors are trying to eat you. So the core anxiety of the Zombie Apocalypse — the nerve-jangling narrative that makes the story a true myth — is the recognition that this global high tech culture we've thrown together seems like a house of cards. Those terrifying scenes of fast-moving "flocks" of zombies exploding through cities in World War Z are a recognition that we've gathered forces we don't seem able to control or even contain (slow moving zombies are just a different form of these energies). So why should we love the Zombie Apocalypse? Because, like all good mythologies, it's trying to tell us something really, really important. The fact that the story keeps getting retold again and again shows us just how badly the thing at the root of the story wants to get our attention. And what is that thing? The Zombie Apocalypse is really trying to tell us about resilience. When I was in Seattle last week I spent some time talking with the University of Washinton's Urban Ecology research group. They do fascinating work thinking about long-term planning for cities. Resilience is a major concern for them. In the face of a changing climate, in the face of limits to essentials like fresh water, how do we build cities that are resilient? And since cities are becoming the dominant mode of human habitation, the question becomes far broader. How can we build a global culture that is resilient in the face of changes coming faster than we expect and more powerfully than we've been prepared for. Watching New York City begin to think seriously about climate-driven storm surges and sea level rise is one example of this new resilience thinking. So it's beginning. Some folks, at least, are starting to address the problem using everything from the most advanced technologies for data flow to the most basic understanding of water flow. Together we might all begin to understand that what we have built must be rebuilt to be more flexible, more adaptable and more balanced with the forces shaping our collective planetary context. In other words this global culture we all use and love must be come more resilient. Thank you zombies for making that so clear.